Powerful 12 volt LED Floodlight includes wall mount bracket. Low energy lighting at its best, rated at IP44 these versatile flood lights can be mounted externally to provide added security around the home or business premises. Being 12V they are suited for use in remote locations where there is no mains power as they can be simple connected to any 12V battery for an effective lighting solution. Other popular applications include lighting for outbuildings such as stables, garages, sheds, barns, warehouses and more. 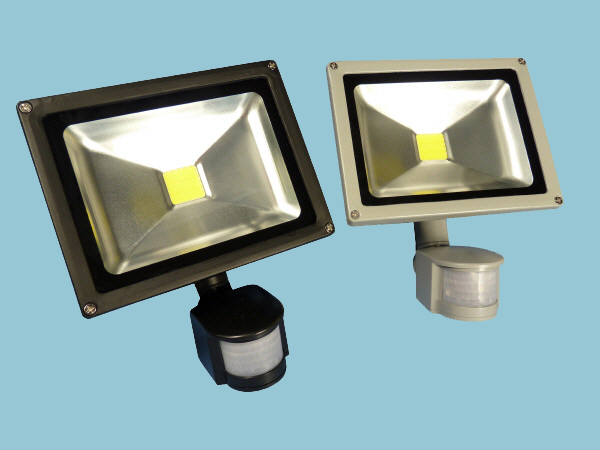 The LED 40W PIR floodlight is the equivalent of traditional HQI/SON floodlights. Made of heavy duty cast aluminium and having an IP44 rating makes them weatherproof and suitable for any installation. They are outstandingly bright, created by single LED chip technology with a lumen output of up to 3340lm and an impressive 40,000 hours of lamp life. They come with a stirrup bracket for easy fitting. Unlike traditional lighting the LED PIR floodlight converts up to 80% of its power consumption into light rather than heat. This makes the LED floodlight much cooler to the touch during and after use than traditional floodlighting. All LED lights last much longer than a traditional lighting solution, or in fact longer than energy efficient lighting. You won't need to replace your lighting as often.